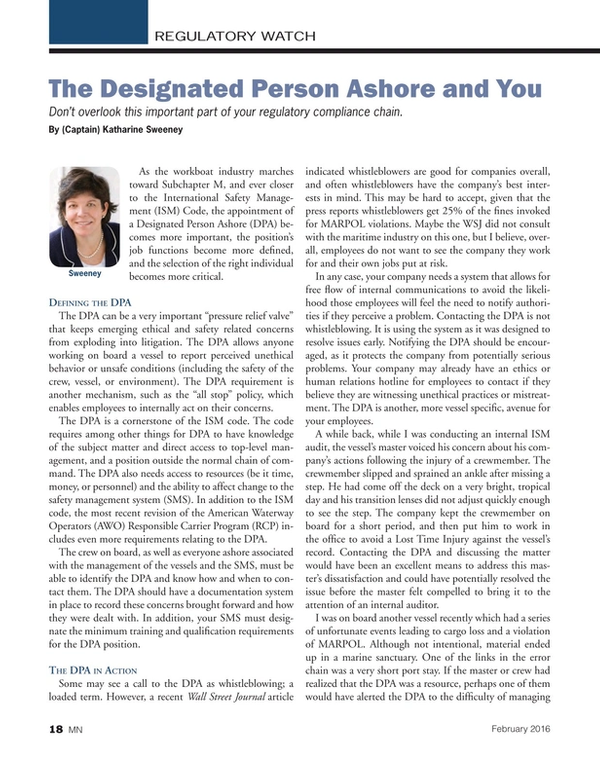 As the workboat industry marches toward Subchapter M, and ever closer to the International Safety Management (ISM) Code, the appointment of a Designated Person Ashore (DPA) becomes more important, the position’s job functions become more defined, and the selection of the right individual becomes more critical. The DPA can be a very important “pressure relief valve” that keeps emerging ethical and safety related concerns from exploding into litigation. The DPA allows anyone working on board a vessel to report perceived unethical behavior or unsafe conditions (including the safety of the crew, vessel, or environment). The DPA requirement is another mechanism, such as the “all stop” policy, which enables employees to internally act on their concerns. The DPA is a cornerstone of the ISM code. The code requires among other things for DPA to have knowledge of the subject matter and direct access to top-level management, and a position outside the normal chain of command. The DPA also needs access to resources (be it time, money, or personnel) and the ability to affect change to the safety management system (SMS). In addition to the ISM code, the most recent revision of the American Waterway Operators (AWO) Responsible Carrier Program (RCP) includes even more requirements relating to the DPA. The crew on board, as well as everyone ashore associated with the management of the vessels and the SMS, must be able to identify the DPA and know how and when to contact them. The DPA should have a documentation system in place to record these concerns brought forward and how they were dealt with. In addition, your SMS must designate the minimum training and qualification requirements for the DPA position. Some may see a call to the DPA as whistleblowing; a loaded term. However, a recent Wall Street Journal article indicated whistleblowers are good for companies overall, and often whistleblowers have the company’s best interests in mind. This may be hard to accept, given that the press reports whistleblowers get 25% of the fines invoked for MARPOL violations. Maybe the WSJ did not consult with the maritime industry on this one, but I believe, overall, employees do not want to see the company they work for and their own jobs put at risk. In any case, your company needs a system that allows for free flow of internal communications to avoid the likelihood those employees will feel the need to notify authorities if they perceive a problem. Contacting the DPA is not whistleblowing. It is using the system as it was designed to resolve issues early. Notifying the DPA should be encouraged, as it protects the company from potentially serious problems. Your company may already have an ethics or human relations hotline for employees to contact if they believe they are witnessing unethical practices or mistreatment. The DPA is another, more vessel specific, avenue for your employees. A while back, while I was conducting an internal ISM audit, the vessel’s master voiced his concern about his company’s actions following the injury of a crewmember. The crewmember slipped and sprained an ankle after missing a step. He had come off the deck on a very bright, tropical day and his transition lenses did not adjust quickly enough to see the step. The company kept the crewmember on board for a short period, and then put him to work in the office to avoid a Lost Time Injury against the vessel’s record. Contacting the DPA and discussing the matter would have been an excellent means to address this master’s dissatisfaction and could have potentially resolved the issue before the master felt compelled to bring it to the attention of an internal auditor. I was on board another vessel recently which had a series of unfortunate events leading to cargo loss and a violation of MARPOL. Although not intentional, material ended up in a marine sanctuary. One of the links in the error chain was a very short port stay. If the master or crew had realized that the DPA was a resource, perhaps one of them would have alerted the DPA to the difficulty of managing rest hours. The point of this sea story isn’t to lay blame based on 20/20 hindsight; rather it’s an example of when the DPA might be contacted. Perhaps contacting the DPA, who may or may not have arranged for a longer port stay, wouldn’t have prevented the cargo loss, but at least the company would have been aware of the vessel personnel’s concern prior to the loss occurring. And, what is most important about this story is the understanding that contacting the DPA is only an available option if the master and crew know the option exists. Some may be concerned that a call to a DPA is a crewmember going around the master. While the chain of command is very important at sea, there can be no blocked valves in your system. Concerns of crew members at all levels must be freely shared, not stifled. Sometimes the master’s relationship with the crew is the issue itself. Or, perhaps the crewmember has tried to resolve issues through the chain of command, to no avail. Arguably, it is then far better for the DPA to be able to resolve issues, early on. Choosing the right person with the right mix of personality and communication skills to serve as the DPA is paramount. This person is tasked with crucial job responsibilities that could expose your company to great risk if mishandled. The DPA can be a key individual both in preventing litigation and when litigation is underway. Originally the title of DPA was simply Designated Person (DP) and some companies used their vessel masters as the DP. The code was then revised to Designated Person Ashore. Clearly, it is difficult for the master to access top-level management, and to meet the other requirements, including being outside of the chain of command. It is also true that it’s increasingly hard for smaller companies to ensure the DPA’s job responsibilities are outside of the chain of command. However, this is not just another hat that this person (the DPA) is going to wear; rather, it’s the main hat they will wear. The port captain, port engineer, vessel superintendents, and the vessel’s other main conduits to shore side operations, including anyone responsible for approval of repairs, make for poor DPA choices. Instead, select someone with strong communications with the vessel crews so that crewmembers feel confident and safe contacting the DPA – someone who will maintain constant and routine dialog with the crews so the individual is recognized as the DPA. Beyond this, Auditors are very keen to look at the company’s organization chart, to see that the position of DPA is included, to whom the position reports to, and if the DPA has any solid or dotted lines to upper level management.